Solar Village Fails Sustainability Test- How Will We Fare? 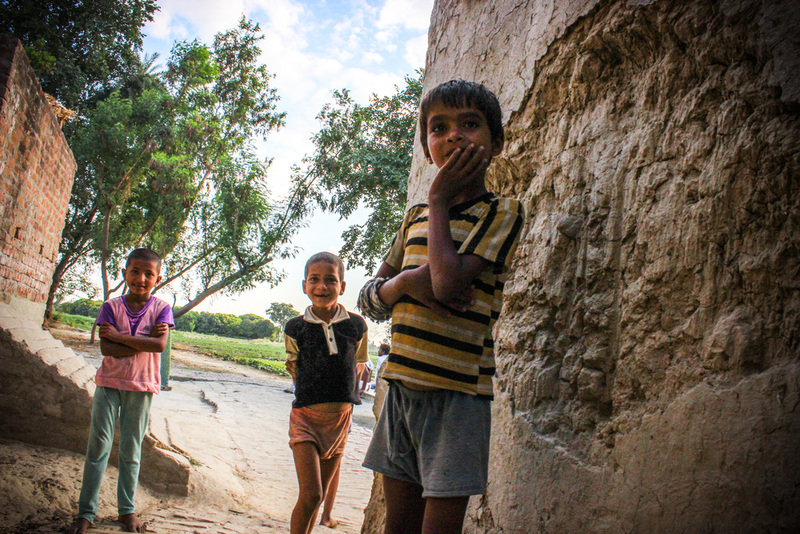 Our team had the privilege of visiting a village on the edge of Lucknow, a north Indian city of over 5 million. Our friend and guide, Gunjan, led us there in order to further our efforts in alternative energy by witnessing firsthand a solar powered village. When we arrived, we were cheerfully greeted by our host and village contact, Santosh. Yet, as we walked through the community, we learned it was far from an idyllic hamlet blessed by the countless opportunities of an efficient solar system. Santosh, our contact in the village, shows Scott Sherrod the solar system sold to a family, on the roof of their home. The panels were propped up on bricks without brace or support. The shadows reveal that they are not facing the sun, and the taller stack is over-shadowing the lower panels, revealing very ineffective, poor planning or implementation. Santosh explained that over 40 homes had been energized by an NGO eight months earlier. Now, many of these systems malfunctioned frequently; others simply do not work. As we climbed onto the rooftop we witnessed a haphazard project: small, tablet sized panels propped on piles of bricks. Many were blown over from lack of proper bracing. Others stood secure, yet were facing the wrong direction or were overshadowed by similarly stacked panels. Santosh added that not a single villager had been trained in the maintenance or installation of panels. When one failed to charge the attached lantern, no one present could troubleshoot. Furthermore, he explained that the systems were purchased through micro-financing, around $40 per system, paid over 24 installments. Many of the villagers were frustrated that they were still making monthly payments, yet had no power. As we ventured deeper into the village, the issues compounded. Children showing signs of malnutrition giggled as they followed after us. Poles to connect power lines throughout the village were empty and abandoned (we would learn that the government utility installed these poles but never wired them to the grid, marking the second failed electrical program in under a year). At every stop, villagers shouted to our guide, demanding repairs. Gunjan translated, “They think we are with the NGO and want to know when we will fix the panels.” He laughed, “If we return here and the panels are not fixed, they will likely beat us up.” He nodded so as to indicate it was only half a joke. A woman shares her complaints with the solar panels as we look at the system installed on her rooftop. 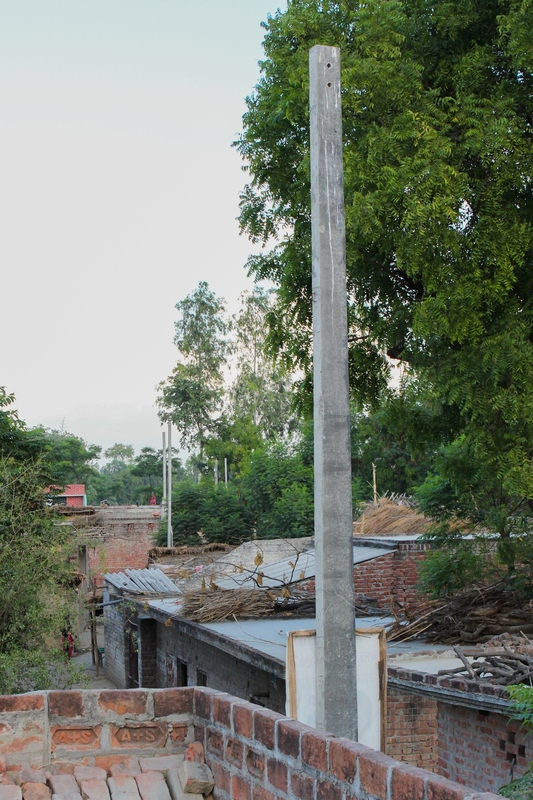 These concrete poles were set by the government to give light service to the village. They have no wires in them at all, and have been empty for over half a year, when they were installed. This means that the faulty solar panels are the only source of electricity for this village. Children from the village we visited. Santosh’s mother­-in-­law (in purple) shares with Rosemary and Rachel her own story, later explaining that she has been sick with digestive issues and degenerative eye sight. A picture of Santosh’s land. This is where he and his neighbors grow food to sustain their families, a livelihood that is in danger of being taken away from them. Rachel says goodbye to Santosh’s mother, thanking them for their time and hospitality. Before leaving, our team stopped at Santosh’s home to pray for his family. We learned that his mother-in-law was dealing with issues of digestion and poor eyesight. 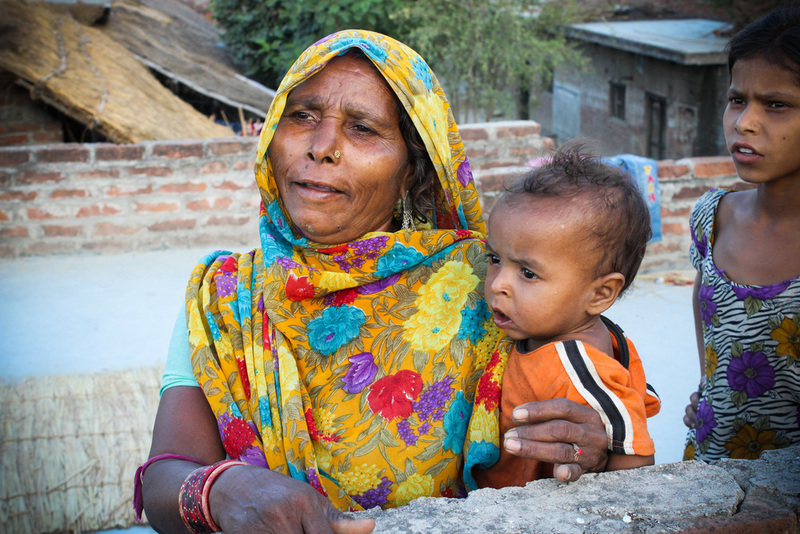 She spoke while holding her young granddaughter, who was far too lethargic for a girl her age. Santosh made a final prayer request before we leave: a company from the city is trying to take his land. Santosh farms rice and chilies on his ancestral land. He does not have an official title because of how land has been passed down in his village and fears that he will not be able to prove ownership of the land. The needs that Jesus calls his disciples to meet in Matthew 10 are holistic: education, health care, social integration. Our organization is committed to these very same goals in India, in the long term. When Jesus sends his disciples to carry out his mission, he gives them a particular paradigm for how they are to work. “As you go, proclaim the good news, ‘The Kingdom of heaven has come near.’ Cure the sick, raise the dead, cleanse the lepers, cast out demons. You received without payment; give without payment. Take no gold, or silver, or copper in your belts, no bag for your journey...Whatever town or village you enter, find out who in it is worthy, and stay there until you leave” (Mat. 10:7-11). Ministering in Jesus’ name comes with specific expectations. The disciples educate and ensure the people have proper health care. They restore the broken to social health, addressing the mental issues plaguing people who lack. Their work is not contingent on money, nor are finances what they have to offer the poor. Instead, it is their own person, competent in skills beneficial for the community, that they offer. Finally, the expectation of time is indefinite. The disciples are to remain present until the needs are met: all are physically and socially healthy, educated and experiencing the incredible blessing of God’s law faithfully put into practice in their community. Jesus’ words require that we maintain presence where we work. Without people present in the communities we serve, we are doomed to follow other well-intentioned organizations. Our solutions should not create more problems. Our service to the poor should not end with their resentment. We are obligated to become people that have the skills, rather than the coins, necessary to respond to the needs before us. Becoming these people takes time. Yet it is the only way we can stay until the work is done.